This is the newspaper advertisement that sets the story of SAFETY NOT GUARANTEED in motion. This apparently was an actual ad placed in a California newspaper way back in 1997. According to the guy who wrote the ad one of his his jobs at that newspaper was to come up with filler ads when the classified ads page came up short. The SAFETY NOT GUARANTEED ad wasn’t one he came up with on the spot. It’s the opening lines of his unfinished novel. I intend to find out if he ever did write that novel if only to see if it’s anywhere near as clever and as fun as the movie. Three reporters for a Seattle magazine are intrigued by the ad that appears in the newspaper in the small town of Ocean View and decide to investigate it to see if it’s a joke or what. Jeff Schwensen (Jake Johnson) talked his boss (Mary Lynn Rajskub) into the whole idea without telling her or his partners his real reason for wanting to go. He plans on reconnecting with a long lost girlfriend who lives there. Arnau (Karan Soni) really doesn’t care one way or another as he’s only interning at the magazine to diversify his resume. Darius Britt (Aubrey Plaza) lives with her widowed father (Jeff Garlin) and is way too young to be so cynical and disillusioned by life. They stake out the P.O. Box stipulated in the ad and find the guy who placed it. Kenneth Calloway (Mark Duplass) works as a clerk in a grocery store. Jeff’s attempt to connect with Kenneth fails miserably but Darius has way more success. Mainly because she treats him with total seriousness. So convincing is she that after a few tests he trusts her enough to accept her as a partner. Kenneth says his purpose in going back in time is to prevent the death of his girlfriend Belinda (Kristen Bell). This touches Darius in a way that begins to crack the stone that her heart has become. Even if he’s nuts, he’s a romantic nut and what woman can resist that? While Jeff is off romancing Liz (Jenica Bergere) and trying to rekindle that long ago relationship, Darius gets closer to Kenneth and slowly she begins to think that there’s a lot more to the story than they thought. Take Kenneth’s insistence that he’s being monitored by the government. Darius, Jeff and Arnau figure he’s just being paranoid. Until it turns out that Kenneth actually is being followed by Honest-To-Will Smith Men In Black. Kenneth also is building some kind of device of incredible sophistication in his garage if the designs and blueprints Darius sneaks a peek at are to be believed. Kenneth also seems to have an exceptional level of technical knowledge for a grocery store clerk as well as mysterious access to huge amounts of cash. But on the other hand, Kenneth has no problem lying about everything and anything and he demonstrates an extremely volatile and even frightening temper. Darius is never sure if Kenneth actually can travel through time or if he’s just forgetting to take his meds every day. Is Kenneth actually a time traveler? Has he done it before and can he do it again? And does the fact that Darius finds Belinda alive and well means that he actually does go back in time to prevent her from dying or is he dangerously deluded? Although I went in thinking that SAFETY NOT GUARANTEED was a science fiction movie (and to be fair…there is a sci-fi element near the end) instead I found a romantic comedy. But it’s not one of those disgustingly trite and shallow romcoms that are turned out with all the creativity and intelligence of a cheese sandwich. The two love stories played out are both unique and delightful to watch. This is a romantic comedy that has actual characters who interact with each other and talk to each other and are not just acting and talking like idiots because the cards handed in by preview audiences said they prefer watching a move with idiots. 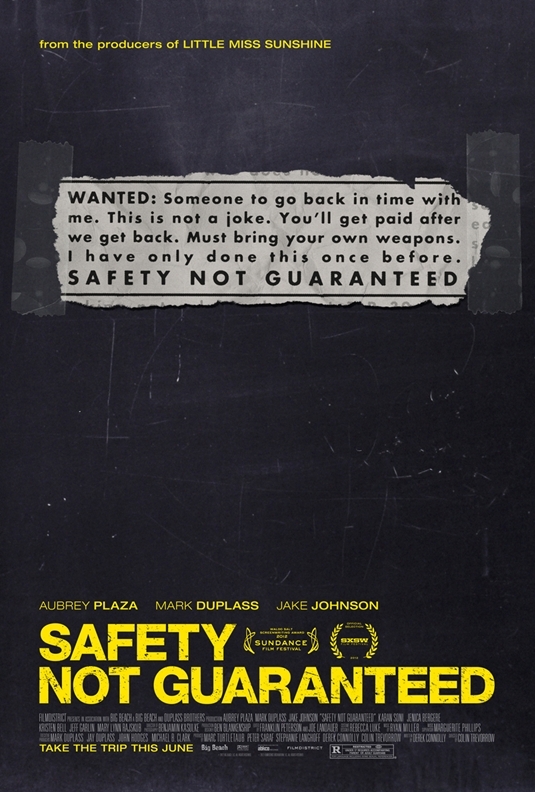 Most of my enjoyment of SAFETY NOT GUARANTEED came from Aubrey Plaza who is the second funniest cast member on NBC’s “Parks and Recreation.” And if I have to tell you who is the funniest then you can just leave the room. Aubrey Plaza has the best deadpan expression I’ve ever seen and she can say more with that expression and those wonderful eyes of her than other actors can with three pages of dialog. 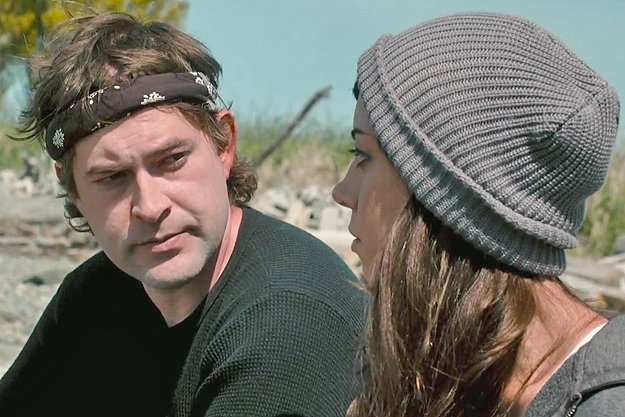 So should you see SAFETY NOT GUARANTEED? If you’re in the mood for a quirky, oddball romantic comedy that doesn’t adhere to the tired formula of the genre, I say give it try. I don’t think you’ll be sorry. I recently reviewed this movie myself. It’s something new I’m trying. I’m glad to know that you also liked it. I’ve come really appreciate your opinions about movies. Great review. I always appreciate your support and I’m glad to know you enjoy my reviews. I’m interested to see what you thought of this movie. It would mean so much to me if you would take a look at my review. It’s posted on You Tube, so I hope that’s not a problem. I’m going to send you a message on Facebook so I’m not needlessly posting my links on your page…I do hope you will take a look at it. I watched this, not knowing what to expect. I absolutely loved it. And I was grinning like a madman during the last few minutes. Brilliant.